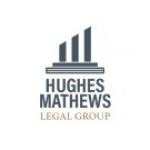 Hughes Mathews Legal Group connects you with nationwide lawyers specialized in personal injury, car accidents, and workers' compensation. These attorneys have many years of experience winning settlements for multiple types of cases including negligence, wrongful death, auto accidents, vehicle collisions, motorcycle and truck accidents, bus accidents, workmans compensation, bus and bicycle accidents, workers comp, construction accidents, dog bites, burn injuries, brain injuries, slip and fall, pedestrian accidents, rear-ended, hit and run, work injury claims, not at fault, bed bug cases, elder abuse, spinal cord injuries, catastrophic injury, broken bones, traffic accident car crashes. We are determined to help you on your way to achieving justice for yourself and for your loved ones. DonÕt be pushed around by insurance companies, employers, and other neglectful parties and take your first step on your way to winning a satisfactory settlement so that you can move on with your life.